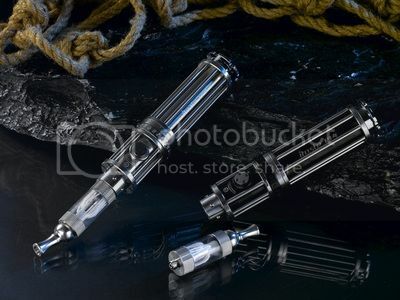 You might be thinking "I think The Vaper got his forums mixed up here, TVF ain't for no stinkin' flashlights", and you're right, however since this product is a mod, which is a clone of the Gatlight, I posted it on both TFF and here. It's the Innokin iTaste 134. I kinda agree, I would much rather have one of these than the real Gatlight. That GatVape is definitely pretty sweet as a MOD. I have a Gatlight clone flashlight and it's pretty awesome and I'd love to have one of these but I hear they are very heavy as well as pricey. One simple thing I want from it is the bent drip-tip for my e-pipe. Well , with an 18650, a metal casing, some computers, and a tank, it seems to be very heavy indeed. PV's over £30-£40 are usually just added features and for show, once you hit that mark, it's not really added performance, more just added shininess.